2008 Concours 14 - First Ride! The original Kawasaki Concours was shiny and new when it was minted back in the mid 80's, when parachute pants were still cool, a company called Microsoft had just released its newest product - "Windows", and you could drive a railroad spike into the ground with your new high-tech concrete block sized cell phone. A gallon of gas set you back about $1.09 and the latest craze to hit the store shelves was an amazing new invention - the Compact Disc! Take yourself back to 1985, and think about what has changed... Really think about it. Kawasaki developed the Concours in 1985 and released it in the 1986 model year and it's remained relatively unchanged for almost two decades. A lot has changed in the motorcycle industry in the last three years, let alone the last twenty. As other OEM's Sport Touring options have evolved, the venerable Concours continued to be produced in virtually original form - until now. In 2006 Kawasaki announced it would be mothballing the old Connie and replacing it with a new version. Jumping the gun with the announcement? Perhaps - many have felt that Kawasaki has remained too tightly lipped about their newest Tourer during the last year, but we're happy to report that the Concours14 has finally arrived! Concours14.com and Bikeland.org members have had plenty of time to read about the C14 and its features, but to ride one? Well - that takes some Black Magic. At Concours14.com we have a commitment to deliver honest and accurate information to our members, so we left our warm, dry home in Anaheim, California and traveled to our secret testing facility in Northern Canadia. If anyone could cast a spell that could make a C14 materialize before anyone else had ridden one, it would be the Canadians. No "Dog and Pony Show" this time. For some mysterious reason (the stronger beer? ), Canada always gets everything first - the cooler bikes, the secret colors - and the Concours14 is no exception. Stop. Do you care about the marketing material and the specs for this bike? Bikeland won't insult you by copying and pasting all of the pre-packaged information they want you to have. You can find those copy - pastes in our News section in the form of press releases from Kawasaki. We're going to focus on feelings and impressions of this bike. The C14 is a big bike, tipping the scales at over 618 pounds dry. Based directly on the successful ZX-14, the new Concours14 sports some interesting changes. First and foremost for all of us at Bikeland is the addition of a second cooling fan. Why is this significant? The versions of this bike on display at the International Motorcycle Shows only had one fan. Again, why is this significant? Read our long-term test of the ZX-14 any you'll see why. The folks at KHI visit Bikeland, and thank God they do. If the C14 handled heat like a ZX-14 it would be utterly useless as a Grand Touring bike, and we'd have no problem telling you. A second fan suddenly appears on the production version! Think of all the money they saved not adding that second fan to two model years of ZX-14's. The next really cool thing is the keyless ignition system. Taking cues from Lexus and Toyota's Prius, the C14 turns itself on and boots itself up with the help of an RFID transmitter embedded in the fob you carry in your pocket. Kawasaki came up with a fancy name for all of this: "KI-PASS" which stands for Kawasaki's Intelligent Proximity Activation Start System - but let's be honest... it's keyless start. Stand near the Connie, turn the giant stove dial shaped key you leave in the ignition of the bike to the "on" position, thumb the starter and ride away. No key. Very cool. Keyless Start. As we mentioned there actually is a metal key, but you never take it out of the ignition except to open the hard bags or get under the seat. If you drop the fob out of your pocket the bike will keep running and begin counting the miles traveled since you were in proximity of the transmitter. In theory, if you were standing beside the bike with the fob in your pocket, someone could jump on, start it and ride away. Also, if you left the fob in the convenient gas tank mounted top glove box, you could start the bike "sans key" and ride away. Being aware of the fob and its proximity to the Connie is crucial so don't store the fob with your gear anywhere near the bike for security purposes! The raised handlebars of the C14 and the relaxed riding position make this bike even easier to ride than its already comfortable sibling, the ZX-14. The clip on risers feel a bit too high for my liking. Though they are vibration free and offer ample leverage and control, some adjustability would be nice including the option to raise or lower them. The electrically controlled adjustable windscreen provides piles of protection, but doesn't eliminate all of the wind or buffeting at its maximum extent for my 6'3" tall body. Ducking down a few inches puts me in the sweet spot of windless bliss, so slightly shorter riders should have no issues. The removable hard bags are nicely designed and are cavernous, easily gobbling up a full face helmet or a case of beer with room to spare! They detach from the bike with ease. Think the Concours14 should spend its life parked in front of a Starbucks? Think again. This Sport Tourer can handle. Power delivery is smooth and dials on nicely. The Connie feels almost overly refined and delivers smooth acceleration on tap from its ZX-14 derived plant. Roll on the power and the bike comes alive about 7 grand. Don't be fooled by its drag racing heritage. This bike feels like it's been detuned just enough to easily meet the needs of owners of the older Concours who are ready to switch. You can feel the ZX-14 power lurking underneath the skin of the Concours, waiting to be uncorked and opened up. The C14 is shaft driven and there is almost no sign of squat on acceleration. The heavier shaft drive is certainly worth the trade off considering the minimal maintenance required versus a conventional chain for long hauls. Hopping onboard a C14 is much like hopping on a ZX-14. The bike is heavy, but its weight disappears under you. Dial on the throttle and you're rocketed effortlessly to license erasing speeds. A wolf in sheep's clothing? The C14 is powered by a plant taken from the fastest production bike on the planet, and needs to be treated with the same amount of respect and discretion that you'd give if you were throwing your leg over a 'Busa, an R1 or a ZX-14 for the first time. Even though engineers have tamed the 14's power, people need to remember this and keep it in the back of their heads when they turn the throttle on the Concours14. Our bike, as tested, comes equipped with ABS front and rear. The brakes are not linked and can be applied independently, whether the ignition is on or not. Simulating panic braking, we were able to activate the ABS on both the front and the rear brakes, bringing our Connie to a quick and reassuring stops. The fit and finish of the new Concours is most likely the best Bikeland has seen the folk at Kawasaki roll out. The paint and overall assembly is top notch and the design of the fairing directs wind away from the rider's legs and torso. The view from the mirrors is blocked ever so slightly by the built in hard bags. It's not a major issue, but was a minor annoyance in highway droning. The fairings seem to contain the heat generated by the bike, although we did experience minor discomfort from the engine heat being displaced onto our legs. The C14 comes equipped with removable baffles you can install to help guide hot engine air off of you in the summer, or onto you to keep warm in the winter. There's little to no room to speak of under the seat, but the Connie does come with a convenient (but smallish) gas tank glove box. Big enough to fit you cell phone, wallet and keys. What about price, and other bikes in the C14's category? Well, that raises another question or two. Why buy a C14 when there are alternatives from the other OEMs like the tried and tested Honda ST1300 or Yamaha's FJR1300? Both are long haulers that have been rigorously developed for years. 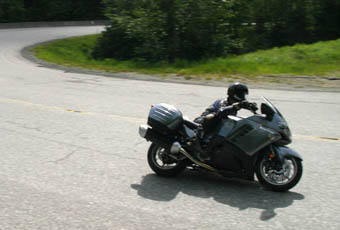 Could you achieve the same net effect and save a chunk of cash by equipping a ZX-14 with hard bags? Possibly. Something that plagues this entire class of Japanese motorcycles - the C14 isn't cheap. With a US MSRP of $13799 with ABS you're getting precariously close to the cost of what some might call a "real" Sport Touring bike. The C14's sticker price means that for only a few bucks more you could lay your hands on a nicely decked out BMW R 1200 RT, complete with cruise control and a sound system. It's closing this similar price point gap that Ducati has capitalized on with their highly successful 1098, snatching buyers away from now only slightly less expensive Japanese OEMs. The original Connie is so antiquated that in our opinion it can't be considered as the source of an evolution for this model. The new C14 is its own machine, a variant of a ZX-14 bearing the old Connie's namesake and nothing more. Separated by decades and also by a quantum leap in technology, the new C14 is as different from its predecessor as the old Beetle is from the new. Kawasaki fan? You've been waiting 20 years for a new Concours? Your day has finally arrived! Don't doubt for a minute - the C14 delivers as promised... Will it stand the test of time? Unknown. With gobs of ZX-14 power on tap and flawlessly smooth handling, we're sure that many of you will begin racking up the miles to find out. So, does the new Concours14 have staying power, or is it a flash in the pan? Visit our forums at Concours14.com and then check back with us in 2028 to find out. Special thanks goes to Burnaby Kawasaki. A small shop tucked away in the outskirts of Vancouver BC, Burnaby Kawasaki continues to provide excellent customer service in a comfortable, family atmosphere seldom seen in today's age of generic boutique type dealerships. You can get a hold of the folk at Burnaby Kawasaki by visiting their website, Burnabykawasaki.com. If your dealer doesn't have a C14, Burnaby can help.